Working with manufacturers and retailers over the past 15 years, Horizon has gained considerable experience and expertise in shop fitting and POS (Point of Sale) logistics, so with us your vital brand support is in very safe hands. From physical shipping, planning and storage through to on time delivery, Horizon provides services across the entire Supply Chain. As many retailers continue to increase their global positioning, transport and freight forwarding services have to be tailored accordingly. Considerable cross trade services and management of movements and specialist providers must be on hand to ensure service continuity. The very nature of retail requires the highest service standards. Last minute orders are often a reality and large roll outs for major shop refits take careful organisation and planning. We are resourced to meet these demands in full, including via our Express Shipments and Time Critical Movements services. At Horizon, we pride ourselves on providing highly efficient warehouse management systems. We operate accurate and up to date stock / inventory records and ordering system and a dedicated team of operational staff ensures orders arrive on time and are careful stored and packed to reach their destination in tip top condition. 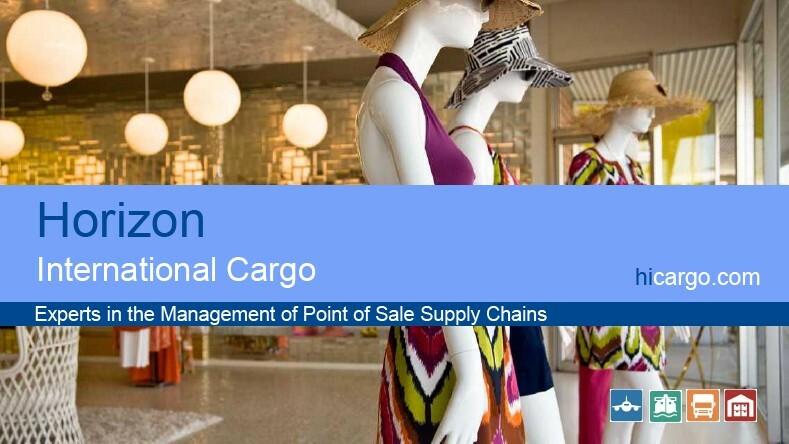 Mannequins, hangers, point of sales material, counter positions, window dressing and display material are just some of the many and often bulky items Horizon manages and controls.